Tint Base Color with Cd attributes stored on the rendered geometry. Tint Base Color with Cd attributes stored on rendered packed primitives. Shade both sides of a surface as if they were the front side. Any transparent part of the shader is unaffected, since transparency relies on the orientation of surfaces to function correctly. Higher values reflect more light and bend refraction rays more. The impact on reflectivity is strongest on surfaces facing directly towards the viewer. Surfaces facing less directly towards the viewer generally reflect more light, regardless of this parameter’s value. The shininess of a surface also depends greatly on its Roughness. To disable reflections completely, set this parameter to 1.0. This can speed up rendering where reflections are not needed. When using a texture, this effect also occurs in completely black areas of the texture. Controls how dull a surface appears. 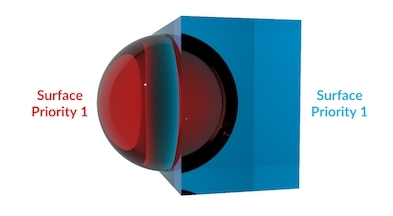 A value of 0.0 results in a smooth surface with perfectly sharp reflections. A value of 1.0 produces a completely dull surface. This simulates microscopic bumps which become more pronounced the higher the Roughness, causing reflected light to be scattered more. This parameter has its own Filter Type parameter which appears when Use Texture is enabled. This defaults to Point (No Filter), which usually works best. When you change this to an actual filter like Gaussian, artifacts may appear around the transition between areas with different direction values. To help with this workflow, the Anisotropy Direction remembers its value whenever Use Texture is toggled. It defaults to 1.0 when Use Texture is enabled, meaning you get the unmodified texture data. Controls the reflectivity of surfaces facing the viewer. This is also affected by the Index of Refraction. How shiny an object appears mostly depends on its Roughness rather than its Reflect value. When you intend to vary shininess using a texture, Roughness is usually the better parameter to use. Controls how transparent the surface is. Both diffuse and metallic reflections are faded as transparency increases. Transparency increasing left to right on a metallic surface. Transparency increasing left to right on a dielectric surface. The amount of subsurface scattering to perform. Diffuse intensity decreases as this Subsurface increases. The mean distance traversed by subsurface scattering rays. Higher values result in light being scattered through thicker regions of the shaded object. The internal color of the surface used for subsurface scattering. Produces extra reflections at grazing angles, which can be useful for matching certain cloth materials. Tints reflections produces by Sheen with the Base Color. This can be help match certain cloth materials. The opacity of the shaded surface. Opacity of the red, green and blue color channels of the shaded surface. Multiply opacity by the value of the Alpha attribute if it exists on the shaded geometry. 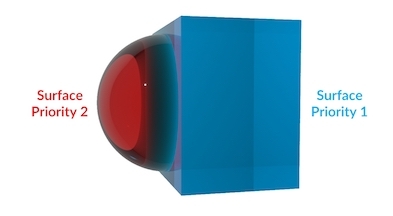 Lets light pass through refractive areas of the surface. This can be used to make the shadows of transparent objects transparent without the need for expensive caustics or indirect light bounces. Tints light using transmission color. Reducing this causes more light to be transmitted when it hits the surface at a grazing angle, where it would otherwise be reflected. Contains texture controls for all parameters on the Surface tab. The type of texture filter to use. This is used for all Surface parameters except for Anisotropy Direction, which has its own Filter parameter. The parameters on this tab are the same as on the Base tab above.